French prosecutors have reportedly launched a preliminary inquiry into allegations that France's leading construction company and a major global player, Vinci, is using forced labor on building projects for the 2022 World Cup in Qatar. The investigation, which began in mid-April, aims to verify claims made by the non-governmental group Sherpa, prosecutor Catherine Denis told AFP on Saturday. Sherpa, whose mission is to protect and defend victims of financial crimes, has filed a claim in a French court against Vinci and its Qatari subsidiary QDVC for "forced labor", "servitude" and "concealment". The allegations have been denied by the construction giant. According to the prosecutor, a larger probe involving investigations in Qatar could be subsequently opened if found warranted. "There more than 1 million of them coming from the Philippines, India, Nepal and Bangladesh on the promise of a hefty salary. Many find only death. Others are forced to work in terrible conditions, and risk their lives daily in huge infrastructure projects for a pittance. This currently takes place in Qatar, the richest country in the world, on building projects for the 2022 World Cup," Sherpa wrote on its website. "The on-site investigations found the use by these companies of various threats to force vulnerable people into scandalous working and living conditions for a paltry salary," the NGO said. Sherpa claims working conditions at construction sites are “unworthy and dangerous,” but that employees' passports have been “confiscated by the company and the workers are threatened with dismissal if they claim their right to better working conditions or housing, or if they wish to resign or change employers. “They are thus forced to accept working conditions unrelated to the remuneration they receive,” it stated. Vinci has denied all the allegations, and has filed a defamation claim in Paris against the NGO. Last year Qatar pledged to improve workplace safety, housing and pay and conditions for its huge expatriate workforce after FIFA came under pressure from rights groups to review its decision to award the emirate the 2022 World Cup, according to AFP. 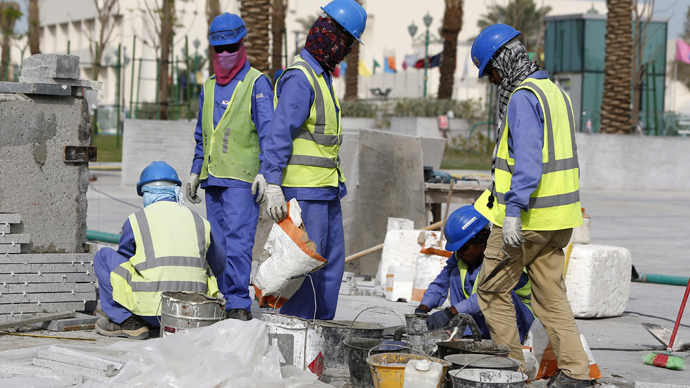 Migrant workers account for nearly three thirds of Qatar’s population of 2.2 million. According to data, revealed in December, Nepalese construction workers building the 2022 World Cup facilities in Qatar have been dying at a rate of one every two days in 2014 due to bad working conditions. The numbers received from the Nepalese authorities show that 188 workers died in Qatar between January and mid-November, the Guardian reported. Figures from the Nepalese Foreign Employment Promotion Board were slightly lower, standing at 157 deaths in 2014. Over 65 of these individuals suffered cardiac arrest and over 30 died in workplace accidents. It's believed that most of the problems stem from mandatory long shifts in searing temperatures. Meanwhile, the latest data does not include the deaths of Indian, Sri Lankan and Bangladeshi workers, leading to speculations that the death rate could be more than one person per day if all the deaths were added up.